Mucho Gusto is the logical favorite to win the 2019 Sunland Derby-G3. 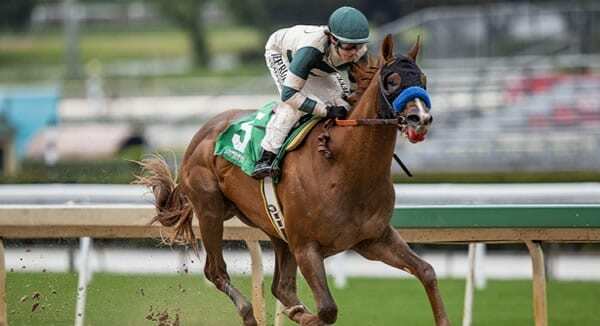 He comes into the race off a sloppy track 4 ¾-length win in the R B Lewis-G3 at Santa Anita and his only career defeat from four starts came last year in the Los Alamitos Futurity-G1 behind top Kentucky Derby contender Improbable. Trained by Bob Baffert, he looks like he has a class edge, and he also proved in his last that doesn’t need the lead to win, an that attribute could prove very important here. Anothertwistafate has won three in a row on Golden Gate’s synthetic surface, leading every step of the way in all his races, including his most recent seven-length romp in the El Camino Real Derby. The only time he ever ran on the dirt was at Santa Anita in his first lifetime start and he finished ninth beaten 15 lengths. He has improved steadily in his last three starts but he may now have to prove two things, the first being his ability on dirt and the second being whether he can come from off the pace if he has to. His morning-line odds of 3-1 seem low, but he is in fine form for trainer Blaine Wright, who is winning at a 20 percent clip. Cutting Humor comes into the Sunland Derby as the beaten favorite in the Southwest Stakes-G3, where he finished seventh beaten 8 ¾-lengths after steadying mildly between horses early and then making a wide move on the backstretch. In late turn he was just off the lead but when winner Super Steed went by him like he was standing still, he threw in he towel and finished evenly, as did many of his rivals. Bet on horse racing online at Bovada Racebook and get a rebate on each bet! Cutting Humor hasn’t shown the competitiveness expected of him for trainer Todd Pletcher, yet Hall of Fame jockey John Velasquez still ships in to ride him. He should get a great trip behind the speed, and at 8-1 on the morning line he’s the likely overlay based on his connections and company lines. Local star Hustle Up is the wild card play at 5-1 on the morning line. He’s won his last two starts at Sunland, including a wire-to-wire victory in the Mine That Bird Derby going 1 1/16-miles in his last. He doesn’t necessarily have to be on the lead, but he will be close, and if he did happen to get loose in here he could go a long way for 22 percent trainer Todd Fincher. Wicked Indeed rallied to finish second in the Mine That Bird Derby in his last and would be another to benefit from a duel in here. The fourth-place finisher in the LeComte-G3 Stakes, he has the right running style for this race and he looks like he’ll go the 1 1 1/8-miles, but we’re wondering if his Beyer Speed Figures may have leveled off in the mid 80s. Walker Stalker finished third beaten four lengths in the Mine That Bird Derby on the class raise after having just broke his maiden before that. He had a decent inside trip in that race and he did take a run at the winner in late turn before tiring in the drive. He fits the angle of second start on the class raise and looks like he could improve. Pasamonte Man rallied from the back to finish fourth beaten 5 ¾-lengths in the Mine That Bird Derby after finishing second to Walker Stalker in that one’s maiden win and will likely perform similarly here. Collusionist finished sixth beaten 13 ¾-lengths in the Mine That Bird Derby and eighth beaten 17 ½-lengths in an allowance race previous to that in his first start off the layoff. A minor stakes winner at two, he hasn’t been able to find his form at three and looks overmatched in here. Eye Cloud finished seventh beaten 14 ½- lengths in the Mine That Bird Derby and is another that looks headed in the wrong directions. It’s difficult to predict who will be on the lead in the Sunland Derby and if one of the speed horses gets loose they could go all the way. The three main speed horses are also the first three favorites in the race. We’re going to guess that Hustle Up is on the lead early, as he looks like he hates to be rated. Much Gusto can either send from the rail or wait briefly and move up to press outside. Anothertwistafate has the same choice. If all three of these horses send, this race sets up for Cutting Humor, Walker Stalker and Wicked Indeed. Here’s our guess. Hustle Up goes to the lead. Mucho Gusto and Anothertwistafate press from the outside. Much Gusto takes over on the turn for home and opens up into the stretch. Walker Stalker makes a bid on the turn and goes further than in his last and Wicked Indeed plods by tired horses late.